Have you purchased a new machine or production line and you do not want to put your investment at risk? Are you looking for a partner who has experience, equipment and qualified employees? OKSEL is a very good choice. As a leader in the field of machinery relocations, we carry out professional disassembly and assembly services of machinery, equipment and production lines. We install machinery and production lines in compliance with the OH&S regulations and using our own specialist equipment. 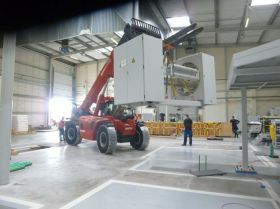 It is very important that the disassembly of machinery and equipment includes a whole range of issues related to transport and the subsequent installation of the devices. Enterprise development is not limited to investing in human capital. Also of great importance are the technical resources without which it would be impossible to develop production. Research work in the field of industry makes it possible to create more and more complex machinery or production lines which are more effective, safer and more economical compared to previous-generation equipment. With the interest of their company in mind, each decision-maker strives to make their enterprise employ new technologies, which translates into increased product quality. We are aware that, in most cases, enterprises do not have the appropriate technical facilities, resources and means to install a machine or a production line on their own. Meeting customer expectations, Oksel’s portfolio of services includes a comprehensive installation service. Our specialists are able to carry out the entire process safely, starting with equipment acceptance, preparation of the whole infrastructure needed for the machine to operate, safe installation, and ending with final commissioning. 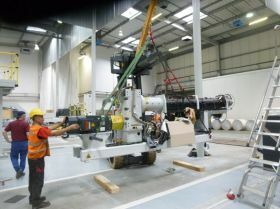 Regardless of whether it is necessary to connect a hydraulic, mechanical, electrical or pneumatic system, our specialists will achieve it in a safe manner, in line with the standards adopted by equipment or production line manufacturers. Each piece of equipment and each machine has a certain service life. When this period is drawing to an end, it is time to replace such a machine with something new. Many production plants do not have adequate knowledge, resources or the ability to safely disassemble a piece of equipment. We render comprehensive services for industry, including installation and disassembly of machinery. 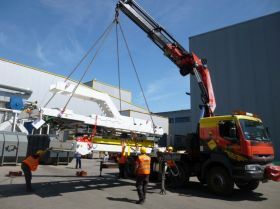 We carry out that process from A to Z, starting with the preparation of a disassembly plan, through physical disassembly itself and machine relocation to another place or its scrapping when its technical condition is questionable.